It would appear that the fascist regime that is our current government is hitting a new low. 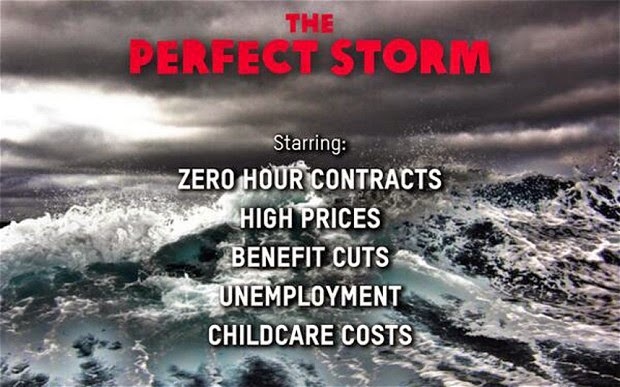 Tories are currently blasting the charity Oxfam for their current faux-movie poster highlighting British poverty under the austerity measures. Have they lied? No. Are they simply pointing out facts? Yes. If the Government are so confident that what they do is 'right' and acceptable, why are they so slighted when it's questioned? David Cameron insists that Britain is a Christian Country, yet where are the governments so-called Christian values? Even as a none Christian I'm aware that Christians believe in hope and charity yet the government are ruthlessly stripping hope from millions of people whilst plundering them in need of charity as they're incapable of displaying any charitable behaviour, other then to their corporate buddies and selfservative selves. Ask the old, the sick and the unemployed where the government's unconditional love is and exactly where the Austerity obsessed government are practising renunciation of worldly goods. Are the government humble? Honest? Generous with time and money? Do they respect all people and are they living a moral life? Are they none hypocritical and none self righteous; practicing what they preach? Do they exude forgiveness? Does this sound like the coalition to you? Are these Christian values compatible with them and their Austerity? Exactly how do the government represent Christianity? They're systematically dismantling society and are intent on the destruction of our rights to a family life, insisting on both parents working longer hours and trying to place our children into the system of formal education earlier both increasing the unafforable child care costs and further increasing the unemployment numbers. Obviously if there's not enough jobs for the unemployed, adding more people such as the sick, the elderly (through ridiculously increasing pension age) and more mothers to the pool is the answer. Creating a latchkey generation and eradicating the rudimentary need for attachment in a child's early years will obvioulsy fix society. Forcing working people into the benefit trap is evidently a genius idea and isn't at all in any way shape or form adding to mental health problems and the breakdown of families. Do we have a nation of hope or one of disillusionment, hopelessness, injustice and rising poverty? Then there's the double standards, the government have stated that they believe charities shouldn't be political, yet they urge them to be political by insisting they participate in the draconian workfare/help to work programme where the unemployed are treated worse than criminals as a punishment for being unemployed. So they're allowed to be political when it suits the government and serves their agenda. Okay then. Because that's not at all hypocritical. No double standards there. Right? There is no freedom of speech, they're blatantly as against that as much as they are against human rights. The government are supporting zero hours contracts. Wages and benefits aren't rising with inflation and thus can't sustain soaring housing, utility and basic food costs and high prices. They have cut benefits and unjustified cruel sanctions are at a ridiculous level. Despite their attempts to juggle statistics through work programmes to temporarily reflect a misleading decrease in unemployment, unemployment is still high and there simply isn't enough jobs no matter how much they mentally torture the unemployed. So exactly how the Oxfam poster is 'wrong' is beyond me. Don't look in mirrors Mr Government if you don't like your reflection.